Swami Kriyananda is the founder of Ananda. He is not on the altar, but is revered by seekers as a model of discipleship, and a “friend and guide” on the path. He had a great gift for helping people grow personally and spiritually, as countless students can attest. At his guru’s request, for 65 years and until the day of his passing, he devoted himself tirelessly to lecturing, writing, counseling, and guiding many students worldwide. In 1968, inspired by Yogananda’s dream of spiritual communities, he founded the first of what are now many Ananda communities and teaching centers worldwide where people can devote themselves to the practice of Self-realization. His books in 28 languages have touched millions, and his music is an integral part of Ananda worship services. A treasury of lectures are freely available at www.ananda.org and on YouTube. Swami at a birthday celebration in 2012. He passed away April, 2013 at the age of 86. He was a disciple of Yogananda for 65 years. And thus began a life of service to his guru that can scarcely be imagined, except that hundreds of people personally witnessed it, some for as long as 40 years themselves on the path, working shoulder to shoulder with him. For a span of nearly 65 ceaselessly busy years, Walters (Swami Kriyananda) expended every ounce of energy in fulfilling his guru’s work. That included writing some 150 books, teaching nearly continuously in America, Europe, and recently also throughout India to audiences in the thousands, founding nine spiritual communities around the world (a long-cherished dream of Yogananda’s), composing hundreds of pieces of music, establishing a new model for children’s education (Education for Life schools), keeping up with endless correspondence, praying for those in need, offering training and mentoring to countless students on the spiritual path in ways that were unique to the needs of each individual. Despite increasingly frail health, he continued a breakneck pace of teaching and writing even in his eighties until just weeks before his passing that left companions in their twenties racing to keep up. Swami Kriyananda lived by two principles: “People are more important than things” and “Where there is adherence to dharma, there is victory.” These ideals guided the development of the Ananda communities begun by him in the 1960s. He clung to them against all common sense — such as when the first community burned to the ground and all that was left was a single home. The cause was found to be a county vehicle. Neighbors sued and won, but Kriyananda wrote to the county saying he had no intention of suing. “We didn’t come here to take, but to give,” he said. What little money the community raised it gave first to families who wanted to leave. Those who remained built again over time, and soon the community was flourishing beyond anything before the fire. “The only way I want people to remember me,” said Swami Kriyananda, “is that, ‘He was a good disciple.’” Those who worked with him closely agreed. Whether it was will power or love, or a peculiar grace, it was the fruit of what yogis say are lifetimes of effort. In his last years, he could hardly speak without tears. He often spoke of indescribable states of bliss, and when you looked into his eyes, you felt it too. He found the Truth he’d been seeking. And he told us we would find it, too. That Truth has long been the promise of the sacred texts of East and West. But not many make the effort. “The harvest is plenteous,” said Jesus. “But the laborers are few.” Farewell to one who labored well. And who showed the way, so others might do the same. Swami Kriyananda passed away peacefully in Assisi, Italy at 8 am on Sunday, April 21, 2013. He was 86. 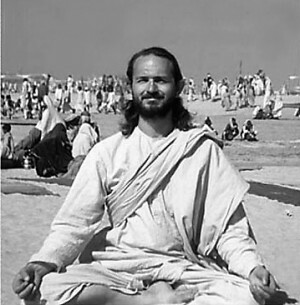 Swami Kriyananda (J. Donald Walters) was been a tireless proponent of Yoga principles for 65 years. In 1948 at the age of twenty-two, he became a disciple of the Indian yoga master, Paramhansa Yogananda. At Yogananda’s request, Swami Kriyananda devoted his life to lecturing and writing, helping others to experience the joy and living presence of God within. He taught on four continents in seven languages over the course of more than 60 years. His television program, audio and video recordings of his talks and music, and his many books (33 languages, 110 countries) have touched the lives of millions of people. Swami Kriyananda has taken the ancient teachings of Raja Yoga and made them accessible to people in every walk of life. His books and teachings cover nearly every field of human endeavor, including spiritualizing business life, leadership, education, the arts, community life, and science. He has written extensive commentaries on the Bible and the Bhagavad Gita. Swami Kriyananda is also known as the “father of the intentional communities movement” which began in the United States in the late 1960s. Inspired by his guru’s dream of establishing spiritual communities, in 1968 he founded the first of what are now nine Ananda communities worldwide. They provide a supportive environment of “simple living and high thinking” where people may live, work, and worship together. The largest and first community (Ananda Village) is home to about 300 people. A monastic nearly all of his adult life, Swami Kriyananda is a Swami of the Giri (Mountain) branch of the Swami Order, as was his guru and his guru’s guru, Swami Sri Yukteswar. He served as the Dharmacharya (leading according to Dharma) and spiritual guide for Ananda communities and activities worldwide. His spiritual successor is Nayaswami Jyotish, who carried his work on today, lecturing and guiding spiritual aspirants around the world. He and his wife, Devi, live part of each year in Ananda communities in India, Italy, and the U.S. Learn more about Jyotish and Devi and their travel schedule. Since his youth, Kriyananda had dreamed of small cooperative communities. But few others shared his enthusiasm, and he gradually put his dreams aside. He was surprised, then, to discover Yogananda speaking often about the need for "world-brotherhood colonies" as environments that would foster spiritual attitudes: humility, trust, devotion, respect for others, and friendly cooperation. In 1967, the opportunity came, with the help of many miracles, large and small. Kriyananda was able to purchase a small piece of land in the Sierra Nevada foothills near Nevada City, California, and started to begin what is now known as Ananda Village. Though thousands of “utopian” communities were started during the late 1960s, only a handful remain today—among them Ananda. More than 300 people live in this first Ananda community. A variety of Ananda-owned and private businesses form the economic backbone of the community. The Expanding Light meditation retreat, a publishing company, schools for children, and a grocery store are among the activities on the rolling 1,000 acres in the rural Sierra foothills. Homes and gardens are well-cared for, and there is a palpable feeling of harmony. Visitors are welcome year-round. Other Ananda communities have developed over the years to include Ananda Palo Alto, Ananda Sacramento, Ananda Portland, Ananda Seattle, Ananda Los Angeles, Ananda East, Ananda Assisi in Italy, and Ananda India near New Delhi. Each community has a spiritual focus (a teaching center and temple) and a community (apartments or homes where members may live). The community in Mountain View, for example, is a large apartment complex with 100 residents, landscaped grounds, pool, shared community room, and temple for group meditations. Swami Kriyananda’s leadership style is at the heart of Ananda’s success. He endeavored to uplift people however possible, through writing, lecturing, music, and acts of kindness. He trained a large number of his students to teach and to assume leadership responsibility in the same way, as free as possible from personal concern, placing the spiritual needs of others primary in any decision. He was a patient and sensitive teacher, allowing people to learn by experience, and putting the needs of individuals above the organization. “People are more important than things” is one of the guiding principles of Ananda life; leaving things undone is preferable when there is spiritual benefit to someone in the middle of learning a hard life lesson. “Where there is adherence to dharma [right action], there is victory” is another of Ananda’s guiding principles. Kriyananda has encouraged his students to live in harmony with others, but also to speak out with courage when true principles are at stake.